Does Downtown Need Another Italian Restaurant? It Does If It’s This One. It feels weird to say this, but when I heard about the opening of Officine Brera, I thought to myself “yet another ‘big deal’ Italian restaurant? Really?” And then I thought about that sentiment, and realized – Downtown LA is really getting somewhere when we wonder whether we have “too many” big, important, statement restaurants. But it is definitely a little bit coincidental/funny that we’ve gotten so many Italian restaurants. The thing is, they’re all great. And, when you scratch the surface, they’re all actually pretty different. Besides the “neighborhood” Italian places like Colori Kitchen, all the little pasta places, and even Bottega Louie, Downtown has seen the rise of Terroni, which I wrote about here; Bestia, which is now virtually impossible to book without a connection (and which I wrote about before it was really even open here, and mentioned again here, but I’m probably due for a new post); and Factory Kitchen, which I mentioned here (same link as previous). I raved about all three of these places, and they are all “big, impressive Italian places.” Terroni is in an old bank building at 8th & Spring with soaring ceilings, a festive atmosphere, everything handmade. Bestia is wayyyy out in the Arts District, and has taken Italian food to another level – even a native Italian nodded his head and said “yep, this is Italian food” when I took him there. 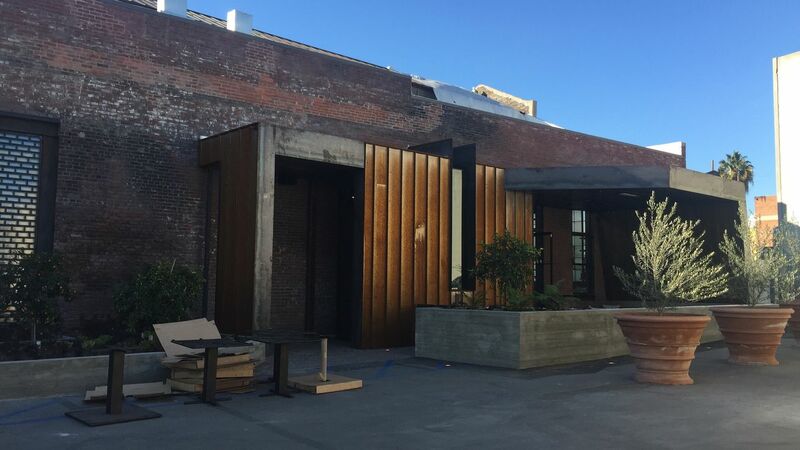 And then Factory Kitchen is also in the Arts District, and is going for a sort of industrial chic thing, focusing on handmade pastas and Southern Italian. Which brings us to Officine Brera. First, it’s another Italian place by the Factory Kitchen guys. Second, it’s in the same building as Factory Kitchen. Which brings us to the obvious questions: Really? Why? The story, apparently, is that the Factory Kitchen guys – who come from Wolfgang Puck and Valentino world, so they know what they’re doing – wanted to do Officine Brera (“officine” is sort of Italian for “workshop” and Brera is an arts district in Milan, so it’s an homage kind of thing) all along. But when they started negotiating with the landlord, they were told the space they wanted wouldn’t be available until, well, now, but that the old factory space on the other side of the building was available then. So they took it and opened Factory Kitchen, to great success. But they never lost sight of Officine Brera and so, here we are. I walked into Officine Brera not exactly skeptical, because I knew these guys would put together a great restaurant, but I guess wondering whether it would feel “redundant.” And the answer is that it doesn’t. It feels, well, big and important. Whereas Terroni is loud and in a historical building and has some whimsy to it, and Bestia is tucked away and feels ‘of the moment’, and Factory Kitchen has its industrial chic vibe, Officine Brera is big and brawny and airy, full of wood and brick and cast iron and exposed ducts. This is all intentional. 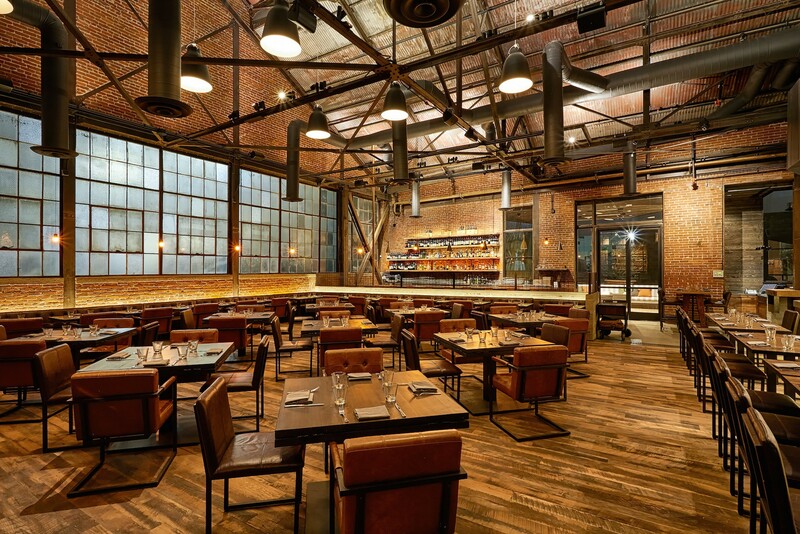 Factory Kitchen focuses on Southern Italian food, so it’s more handmade pastas and approachable and simple. Officine Brera focuses on Northern Italian food so it’s fire-grilled meats – the place has a wood burning oven AND a rotisserie AND two grills – and rice dishes and fish. So is Officine Brera “yet another” big Italian place? Yes. Is it totally worth it? Yes. And besides, do any of us ever really get tired of Italian food? No. And, at least speaking for myself, will I ever get tired of ‘big, important’ restaurants doing well in Downtown? No.